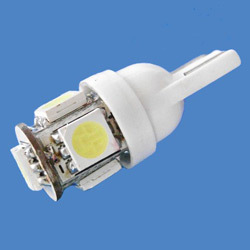 Manufacturer of LED Strip, LED Module, LED Tube Light, Amusement LED Lamp, Car LED Bulb, LED & SMD. 2. Long service lifespan: 50,000 hours. 3. Solid-state, high-shock, and vibration-resistant. 4. Designed to work in negative ground vehicles. 6. Customized designs are welcome. 7. Applications: parking, stop, and turn signal. 1. 5pcs 5050 SMD LEDs. 2. Base: T10. 3. Colors: white, red, yellow, blue, and green. 4. Easy DIY installation universal design. 5. Solid-state, high-shock, and vibration-resistant. 6. Low power (wattage) draw, puts less load on the automotive electrical system, like alternator and battery. 7. High-intensity. 8. Built-in current-limiting resistors. 9. Low heat generation. 10. One-year quality warranty.